The Ta Prohm Temple was completed in 1186, and stands in the middle of the remote jungles of Angkor, Cambodia by the Khmer civilization. A recent expedition to the site revealed a startling discovery: carved into the walls of the temple appears to be the image of a Stegosaurus. Naturally, the traditional scientific community has already begun to volley rationalizations and excuses for how the depiction of a living, breathing, previously-believed-to-be-extinct-for-more-than-155-million-years dinosaur wound up on the wall of a relatively modern structure. 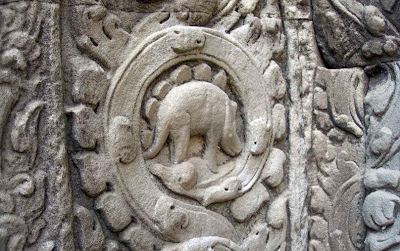 But we contend that this recent discovery at Ta Prohm is just one more substantial example of art and literature that has often - directly and indirectly - alluded to humans and dinosaurs co-existing in the same eras. Some of the more famous are the Palestrina Mosaic, and the Anasazi Petroglyphs.